You’re on Funny Birthday Wishes and Sayings – Page 9 of 10 Birthday Wishes and Quotes. See menu at bottom of page. These funny birthday wishes will give you something to write on Facebook, Instagram, in emails, cards and notes when your friends or family members are celebrating birthdays. Don’t just go with the tried and true: Happy Birthday! Or, even the less work approach: HBD! Try something new – stand out from the crowd. Birthdays are meant to be celebrated in person. Friends, family and all acquaintances shower the person with birthday wishes and blessings. Everyone desires to bring a smile to the person’s face and make their day special. Whether they are going to celebrate the day with a grand party or with just a small get-together of closest friends, it is always a good gesture to send the birthday boy or girl your best birthday wishes. Hopefully, these funny birthday wishes will bring a smile to their face and make the day a little more special. Happy birthday. Don’t be sad you’re a year older. Keep your chin up…if you can! Well, you know what I mean. Stop counting your candles and start counting your blessings. You still have hair on your head, not in your ears and nose! Happy birthday. Happy birthday! At this point in your life, you should really think of making a new start. You should really start lying about your age. 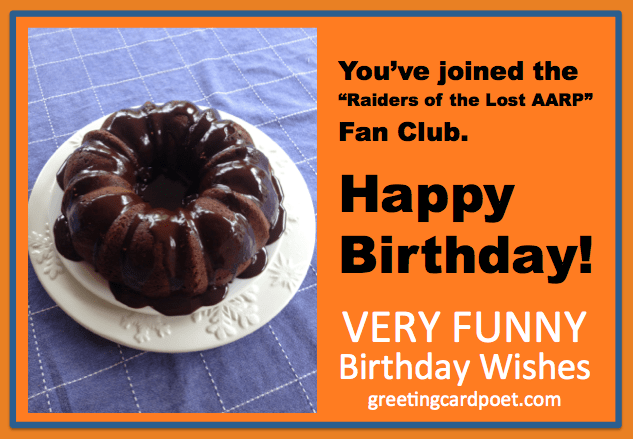 You’ve joined the “Raiders of the Lost AARP” fan club. Happy Birthday! For your birthday, I wanted to give you something that was both funny and charming, but then I remembered you already have me in your life. If anyone calls you old, hit them with your cane and throw your teeth at them! Happy birthday! Happy birthday. At your age, you should really try to see everything as larger than life…starting with LARGE print. You know at your age your not getting any easier to live with – let’s start with the fact that we have to wait in line longer while you show cashiers your AARP card. They say that with age comes wisdom. I’m not so sure…I’ve met a lot of really stupid old people. So far, you’re not one of them. Happy birthday. Someone your age shouldn’t say “chill” unless they’re talking about the weather. First goes the memory, then your eyesight, and then…I forgot. But, have a great birthday. It just reminded me that weeds don’t easily die. Have a blast on your birthday! Real men are proud of their age. Happy birthday! Considering all the candles on your cake, I hope you remembered to top up your fire insurance. Big boys don’t need toys. But big boys should eat and blow their cakes. May you have the best birthday ever! Why people like you get depressed on birthday for becoming old. If you think on it, you are getting old on left 364 days of a year. Happy birthday! Happy birthday! Another year, another reason to curse the inventor of the first modern mirror. I lift a toast for your being older than last year. It’s still an achievement though! All the best this year for you! You should be proud of your age. This year you are wiser, smarter and very close to reaping the benefits of senior discounts at restaurants. Happy birthday! From this point forward, this is the youngest you’ll ever be. HBD! Yes, you’re getting older and wrinklier every day, but it could be worse…you could still have an acne problem! Happy birthday! My dear friend another year has gone, but unfortunately that doesn’t mean you’ve become any wiser. Chill! Happy birthday dear! Sure, getting older is like a time travel movie in slow motion…but better slow than fast, I always say! I’m in no rush to get to the end of the film. Happy birthday! On your special day, I wish you peace, love, insight, relaxation, fun, knowledge, romance, friendship… and all that stuff that doesn’t cost anything. Happy birthday! You are only young and reckless once, but you can be reckless well into your hip-breaking days. Happy birthday! For your birthday this year, I hope you don’t mind if we avoid the fire hazard of so many candles and use electronic candles, instead. Happy birthday! Happy Birthday to my wild and crazy friend. Thanks for keeping all of the adults busy with your antics when we were kids so that I never was punished! Until I start letting them know things you never confessed! And here’s to many more over the next many years! I’ll assume it’s the therapy, I won’t inquire about how. Happy birthday dear! And for that we only have our parents to blame! Happy Birthday to my sweet brother. I hope you get one more disease of love and relationship. May virus of fun enter to your life? Happy Fun and humor on Birthday. This hilarious Birthday wishes is only for you. I asked Mom and Dad to tell me about the day you were born. Know what they said? They can’t remember that far back! I guess that means you’re ancient. Happy birthday, old guy! It’s your birthday so I’ll cut you a little slack! Don’t worry, brother, age is only a number. Although, in your case, it’s a very, very, very, very big number! Happy birthday! For your birthday, I decided to get you some practical gifts. Now, I know you might think the toupee is a little bit over top but, seriously, it won’t be long now, brother! Happy birthday! Happy Birthday to one old fart from another! We’re so blessed to be able to grow old and senile together. Who knows—we might even get to be roommates in the old age home?! How crazy would that be! You’re the best brother anyone could ever ask for! Happy birthday! These funny birthday wishes can serve effectively as Facebook captions, scrapbook comments or Instagram caption. No woman should have kids over 40. Really, 40 kids is enough. Happy birthday! ‘May all your dreams come true’ – this is what I wished you on your twentieth birthday. ‘I hope all your dreams have come true’ – this is what I am hoping for you on your fortieth birthday because it is too late to start dreaming now. Happy 40th. Some birthday advice: don’t run upstairs right before you have to blow out 40 candles. Happy birthday! 40 is when you finally get your head together and your body has other ideas. Happy birthday! Age is relative. If you think you are twenty, you will feel like you are young and twenty. If you think that you are fifty, you will feel like you are old and fifty. So how young do you want to feel on your fortieth? Happy 40th birthday. Be wise with speed; a fool at forty is a fool indeed. Happy birthday! Forty is the age when it suddenly dawns upon you that life is indeed, very short. Better late than never, start doing the things that you have always dreamt about. Happy 40th. Be happy that you are still 3,650 days away from turning fifty. Maybe this is the only way you can console yourself about turning forty. Happy 40th birthday. Any funny birthday wishes ideas? Send your suggestions to us via the Contact page. Thanks!